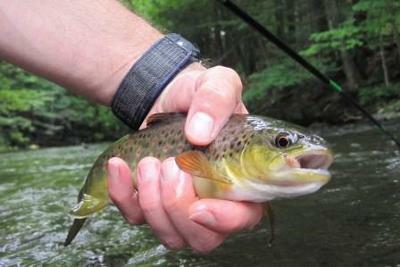 One of three browns (the biggest) that fell for a Killer Bug on a recent muggy day in the lower Hudson Valley. I would expect nothing less! I really do wonder why I fish anything else. In my very limited experience with Killer Bugs, they work great on tailwaters but not as good on free-flowing streams. More shrimp/scuds/etc in the water? I pretty much only fish tailwaters but a recent comment by rmcworthing on the Tenkara USA forum "First, it seems to be working. Really well. It's got me pretty close to a one fly angler lately. It seems to produce in a variety of waters, big and little, rich and poor, whether scuds are around or not." suggests that they work anywhere it's wet.